Concessions are available to full-time students, senior citizens, children, unwaged, people with registered disabilities. ‘Theatre Union’ concessions include Equity, BECTU, Stage Management Association, SDUK & Writers Guild. All concessions are subject to availability and must be mentioned at the time of booking. We don’t charge a booking fee for tickets when booked in person or on the door. Tickets sold via the website will have an additional booking fee but this will be stated throughout the booking process. 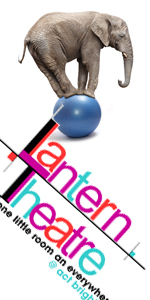 Tickets must not be sold for profit or commercial gain by any outlet other than The Lantern Theatre. Failure to comply will make this ticket and transaction void. If a performance is sold out we will endeavour to sell any returned tickets to the waiting list for that specific performance only, subject to availability. If a ticket is resold we will issue you with a refund for your ticket. Tickets may be collected from the Box Office 30 minutes prior to the show start. We recommend picking up your tickets at least 15 minutes before the performance begins. Please bring along your E-Ticket. Once purchased tickets cannot be refunded. We will only offer ticket refunds for cancelled shows. We have unreserved seats, however, if you have specific access requirements we will reserve seats for you to help make your visit more enjoyable. Please let us know when you book your tickets. We will do our very best to accommodate you if you are late. Most of our performances have a latecomers point, or a latecomers cut-off point, so that we can get you into a performance with a minimum of disruption to other audience members and to the performers on stage. In certain performances, however, it can be hard to accommodate latecomers, as the audience entrance opens out onto the stage, and can easily disrupt a performance for performers and other audience members. Unfortunately, we cannot offer refunds to patrons who are unable to see their shows due to being late, so please try to arrive at the theatre at least 30 minutes before your show starts.